Gerry Meehan was recently featured in a documentary called "Defector," about Alexander Mogilny, the first Russian hockey player to defect and play in the NHL. 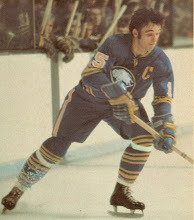 At the time, Meehan was the general manager of the Buffalo Sabres. On May 10, 2016, Meehan participated in a discussion on the topic at the Robert H. Jackson Center. It's 50 minutes long and well worth watching.